The F3 Treadmill is the first of its kind— a foldable treadmill that doesn't sacrifice quality. It's loaded with everything that has made Life Fitness treadmills the top choice among discerning exercisers around the world. And the highest-quality components ensure years of rugged use. The F3 is so sturdy and sleek, you'll be amazed that it actually folds. Pair it with the Advanced Workouts Console for added workout variety and advanced programs to better help you reach your fitness goals. Customization options are determinant upon console selection. Advanced Workouts console includes My Treadmill feature to store personal settings and custom workouts for up to 2 users. Each user can create 1 custom workout. Simple navigation and ergonomically placed controls, including a lower control pad that brings the buttons you use most often closer to you. And the GoSystem™ Quick Start feature remembers your preferred walk, jog and run speeds, as well as three different incline positions, so you can get started with the push of a button. *Note: Most of the sites, stores or shopping portals listed above sell Cardio Fitness F3 Advance Console Treadmill with discounts and other exciting offers. There is a possibility that the some of above websites are not selling Cardio Fitness F3 Advance Console Treadmill now. Toughtrain.com is not liable for such cases or instances. 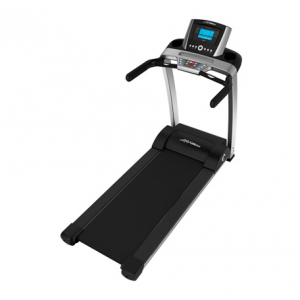 Also we do not recommend any seller for Cardio Fitness F3 Advance Console Treadmill and a buyer should buy from where he/she gets best deal with quality of products, service and on time delivery (shipment).